Horses and riding sports don’t mix well with instant gratification. Riding is a sport that takes years and decades for the human to master. And horses are not animals that react well to rushing and cutting corners. In most cases, slowing down will get you there faster with horses. When training is rushed, and important steps are missed, mastering even the simplest skill can seem impossible. Without question, when it comes to training horses, cutting corners always results holes in your horse’s training, which will come back to haunt you at the most inconvenient time. Undoing poor training is much harder and way more time consuming that training an untarnished horse the same skill. Cutting corners will cost you more time in the long run, which is why for thousands of years, horse trainers have known that slower is better when it comes to horses. Although horses are incredibly fast learners (a by-product of being flight animals and prey animals), there’s a significant difference between acquiring a new skill and mastering that skill. The challenge with horses is that how fast they learn and how fast they master any given skill is directly related to the effectiveness and consistency (skill level) of the rider or handler. Because horses are prey animals, they are highly sensitive, and they feel all kinds of pressure (physical, mental, environmental) keenly. Therefore, we apply pressure and release it to train them (negative reinforcement refers to the removal of pressure). Two factors dictate how quickly the horse learns: timing and pressure. A timely release/reward comes within one second; using adequate pressure—neither too little nor too much—requires excellent judgment and ability from the rider. With good timing and adequate pressure, the horse learns rapidly. If the horse isn’t learning fast or is learning the wrong things, you must consider the human side of the equation. Because horses are such fast learners, they unfortunately learn the wrong things just as quickly as they learn the right things. The horse may learn to perform the skill incorrectly because the rider inadvertently released the horse at the exact wrong moment. I see this a lot in teaching complex maneuvers like pivot on the haunches. The horse takes one or two good steps in the pivot, then the rider gets greedy and asks for more, then the horse steps incorrectly and the rider releases him. I see riders asking for collection or some sort of headset, but instead of releasing that horse the instant he’s giving the correct response, they hold the horse too long until he starts resisting, then they release him, training the horse to throw his head up. Getting in a hurry rarely works with horses. Their perspective of time is much different from the average human, who tends to think in the future and dwell in the past, but is rarely present in the moment. We always have a plan, an agenda and a schedule to adhere to. Horses don’t. Horses are very much here-and-now animals. We humans stand to learn a lot from horses on this subject. Have you ever tried to train a horse to trailer load when you had limited time to load and get somewhere? Have you ever had a normally easy-to-catch horse stick his tail up in the air and run around for twenty minutes on the day you were pinched for time? I rest my case. Sometimes going slower with horses is very literal. Slowing down your body language and reactiveness when you are doing groundwork, will almost always have the effect of softening the horse’s response. Slowing down your hands when using rein aids, literally moving them slower, will improve the responsiveness of your horse. Try it. Going slowly in the training of a horse means that we take small baby steps; we walk before we run and we don’t skip steps. We follow the important tenants of classical horsemanship, which have proven to be a successful recipe for training horses for thousands of years. We teach foundational skills before asking for complex maneuvers. Trying to teach a horse collection, before he has mastered the most fundamental skill of a riding horse—to move freely and willingly forward—will never work. There are many seemingly simple skills of a riding horse that riders are often impatient to learn, like collection, flying lead changes and side passing. Rarely have I done a clinic (in the past 30 years) where a rider didn’t state one of these skills as a desired outcome for the clinic. Each of these skills require the horse (and therefore the rider) to master many foundational skills, a pre-flight checklist so to speak, which may take weeks and months to achieve. Only the most dedicated riders will devote the time needed to build the proper foundation for that skill and not get frustrated with how many steps are required to get there. For both humans and horses, when mastering a new skill, there are stages of learning that describes how the individual typically advances through a predictable series of learning stages before mastering the skill. At first, the student (two-legged or four-legged) is halting and uncertain is using the skill, but gradually, through practice and guidance, the individual becomes more proficient and confident in the skill. When we partner with horses, both horse and human are sometimes learning the skill for the first time together, and both animals have to move through the stages. With horses, it usually works best when one individual has already mastered the skill. In other words, if the rider does not know the skill, let’s say how to cue for and ride the canter, she will move through the stages must faster on a horse that has already mastered this skill. If the horse knows nothing about cantering with a rider on its back, it’s best trained by a rider that has already mastered cueing for and riding the canter. The hierarchy of learning a new skill involves acquisition, fluency, generalization and adaptation. While this is common knowledge among educators of humans, it’s also highly applicable to the training of horses. Let’s look at the most fundamental skill of a riding horse—to go forward. The very first time we ride that young horse, we have to teach it to go, turn and stop, but at first, he knows absolutely nothing. So, you flap your legs, cluck, wave your arms and otherwise apply pressure until the horse takes a step forward—then you immediately release the pressure, praise, and hopefully the horse learned something. The next time you ask that horse to move forward and it only takes a little wiggle of your legs and a couple clucks before he steps off, your horse has just acquired a new skill. The next phase the horse moves through is fluency, and that will take some time; how long, depends on the skill of the rider. Although the horse has acquired the skill, he is still tentative and slow to respond. As he becomes more fluent, his response time increases, your cues get lighter, and he becomes more confident. Now the horse moves off with a slight closing of the rider’s leg. Then we reach one of the most challenging and time-consuming phases when it comes to training horses, and that is generalization. This phase is not complete until the horse can perform the skill in any situation or any setting. No matter where you are or how emotionally your horse has become, he still responds accurately and promptly to the cue and performs the skill. Since horses are very location-specific in what they learn, having to perform the skill in many various locations requires a lot of time and effort. You can train a horse to perform to a very high level at home and practice for years, then take him somewhere else to perform, only to have him fall apart and become nonresponsive (or worse). A generalized horse is what we call a “seasoned” horse—he’s been hauled around and learned to perform his skills at the same level away from home that he does at home. This can take years. Adaptation occurs when the horse or human is so accurate and confident in using the skill, that it can be applied to new and unique situations and the horse will adapt his skills to the demands of the new situation. Think about the high-level cross-country jumping horse, who adapts the jumping skills that he learned in an arena starting with ground poles and cavaletti, and now he gallops boldly through a course he has never seen, jumping huge, scary obstacles, landing blindly in potentially hazardous footing like a water obstacle. He can adapt his jumping skills to any type of obstacle, in any situation, even one he has never experienced. Complex maneuvers are almost anything that we teach a horse beyond stop, start and steer. Advanced maneuvers generally require putting two or more foundational skills together to perform the maneuver, like collection, leg-yielding, side-passing, pivots on the forehand and haunches, lead changes, jumping, rollbacks, and the like. One of the earliest complex maneuvers we encounter in the training of a riding horse is the canter departure. 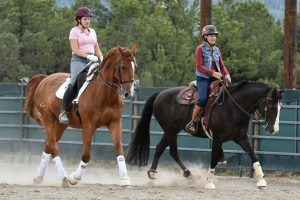 Before that horse learns to step off quietly and smoothly from a walk into a canter on whichever lead asked, there are many smaller steps which take time to accomplish. Knowing what the smaller steps are, being able to break down that skill into the smallest steps, and being willing to spend whatever time it takes at each step of the way, are the hallmarks of success in training horses. Precursor skills always exist in complex maneuvers. For instance, before a horse and rider can flawlessly perform a flying lead change on command, they must both be able to execute walk-to-canter transitions on the correct lead 100% of the time; halt-to-canter transitions, dead-leaded; collection at the canter; an obedient and balanced counter-canter; haunches-in walk, trot and canter; leg yielding walk, trot and canter; etc. When you take the time to accomplish these lesser skills, flying lead changes are easy. Because horses are very fast learners, acquisition of a skill can (and should) happen fast. But one response, does not a habit make. How fast a horse moves through the stages of learning is directly proportionate to the talent of the rider. Whether it takes a day, a week or a month to get fluent in a skill, fluency must occur before moving on to the next phase. This is true of each smaller step or precursor skill. When you try to fast forward though any stage of a horse’s training by skipping steps, you end up training the wrong response to the horse. For all the complex maneuvers that we train horses to do, physical strength, stamina and coordination are required—that takes weeks and months to develop, not hours or days. While most of the maneuvers we ask horses to perform are movements they can do naturally, packing the weight of the rider (who is often getting in the way of the horse) makes it much more difficult for the horse. Pushing a horse faster than his physical strength and coordination can develop generally results in a burned-out horse, an injured horse, or both. It’s no wonder that slower is faster when it comes to horses and learning to ride. When both the horse and the rider are learning new skills together, it will take even longer. It’s important to strive for correctness in training, which means releasing at the right moment, and making sure that you are giving the correct cues and training the correct response. Quality versus quantity. Beyond precision, it’s important to be patient, to slow down your actions and expectations—to walk before you run. The ability to break down complex maneuvers into the smallest steps and then refine each step, to build a solid foundation, is one of the most crucial factors in successful horse training. This requires a lot of knowledge and a high skill level; if you do not possess the knowledge and skills yourself, you need help from someone who does. You can find that help online, at JulieGoodnight.com/Academy. Goodnight is the popular RFD-TV host of Horse Master airing Monday nights. Goodnight travels the USA sharing her no-nonsense horsemanship training with riders of all disciplines. Goodnight has ridden in many different saddles– she’s experienced in dressage and jumping, racing, reining, cow horse, colt-starting, and wilderness riding. Goodnight grew up on the hunter-jumper circuits in Florida, but is now at home in the West. She and her husband, Rich Moorhead, live in the mountains in Salida, Colorado. 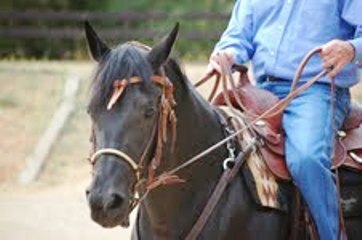 Both love versatility ranch horse competitions and riding cow-horses. Explore her online library and many training videos at http://TV.JulieGoodnight.com; be sure to sign up for the free monthly training news at http://JulieGoodnight.com and please subscribe to the free YouTube channel at http://YouTube.com/JulieGoodnight. Is My Saddle Causing My Horse’s Issues?